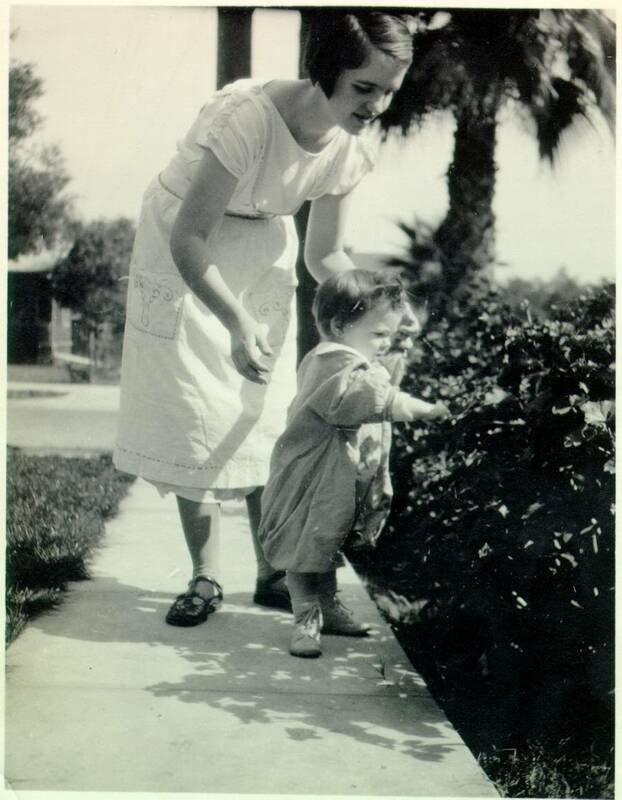 Ava Helen and Linus Pauling, Jr., 1926. 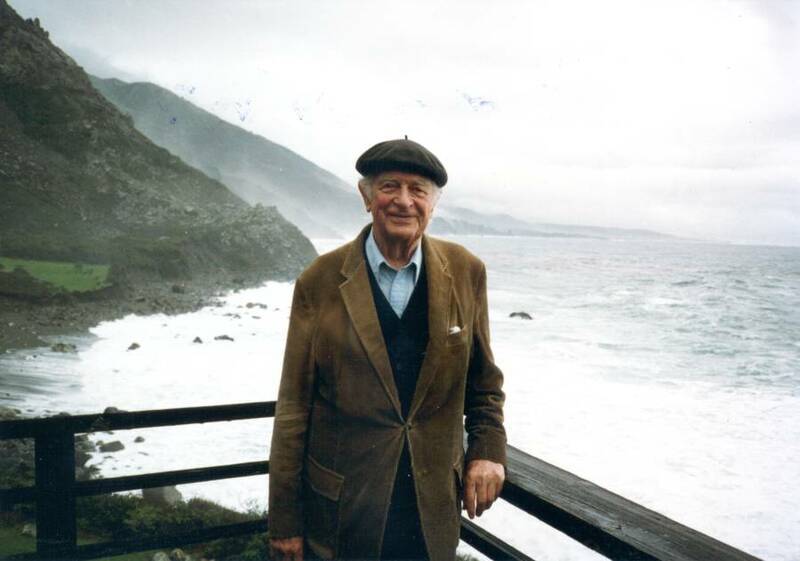 A. Viste, emeritus, Augustana College. CHOICE, 45-0288, (September 2007). 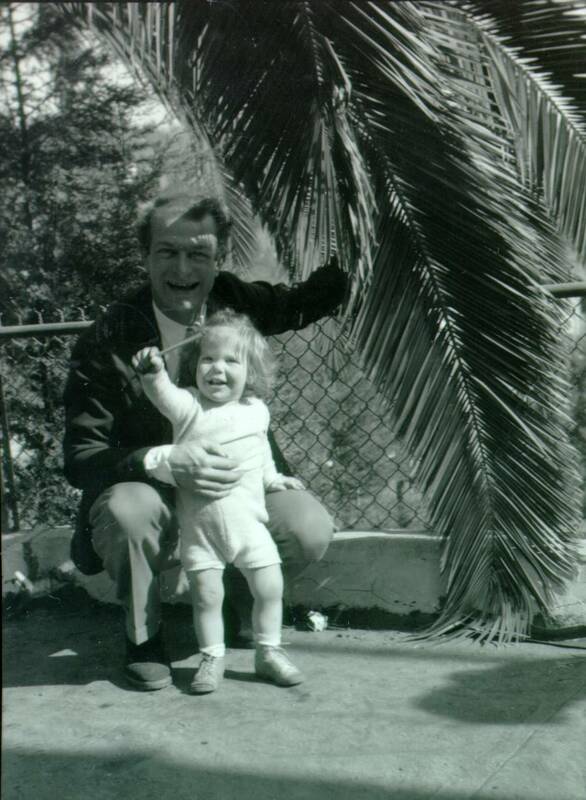 Linus and Crellin Pauling at the Huntington Gardens, San Marino, California, 1939. 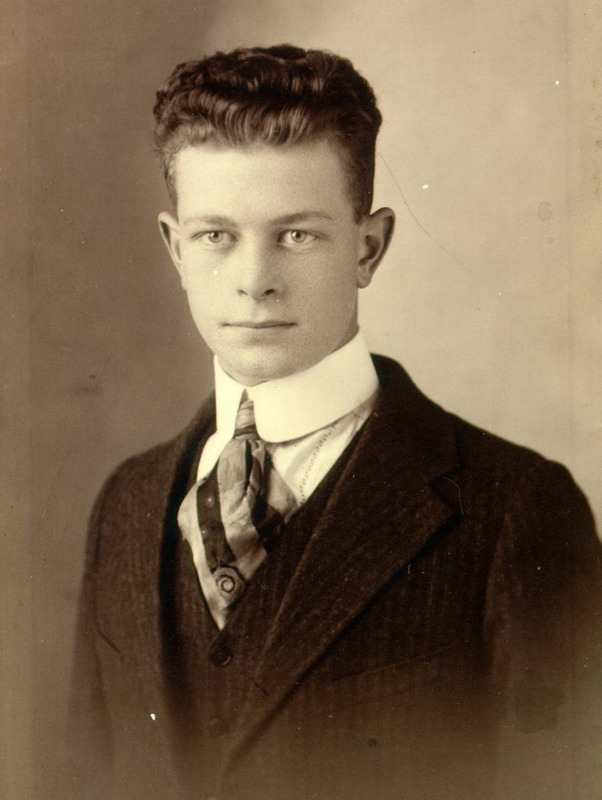 Jack Dunitz, ETH-Zürich, Switzerland. Bulletin for the History of Chemistry, Vol. 33, No. 1 (2008): 45-46. 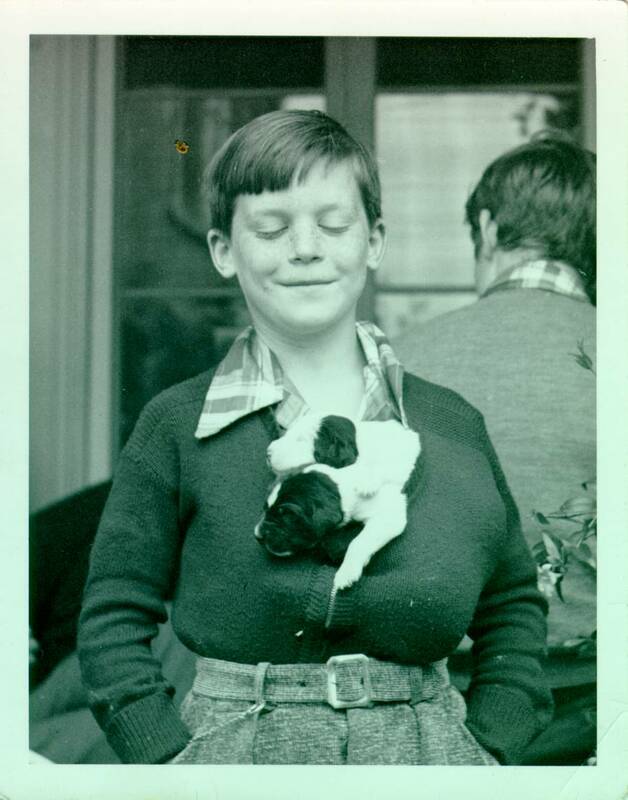 Peter Pauling and two friends, 1940. Gregory J. Morgan and Emily A. Jones, Spring Hill College. Journal of the History of Biology, Vol. 41, No. 2 (June 2008): 403-406. 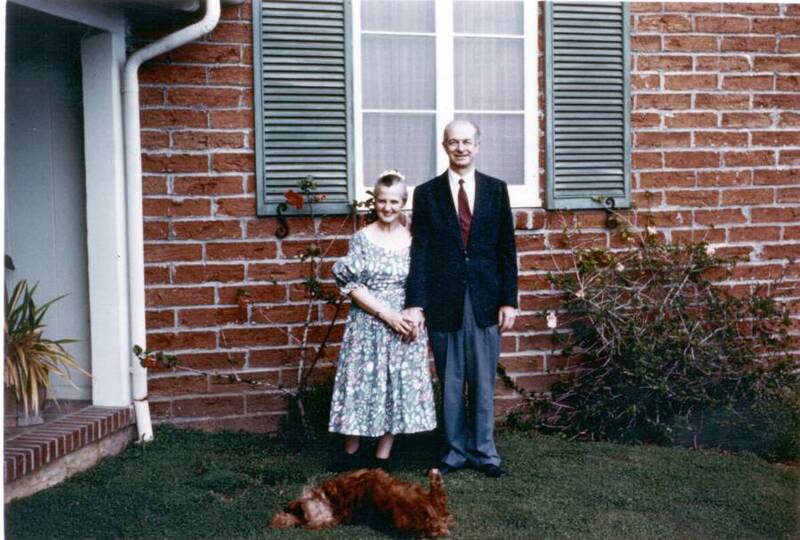 Ava Helen and Linus Pauling at home, 1957. Jack Dunitz, Bull. Hist. Chem., 2008. 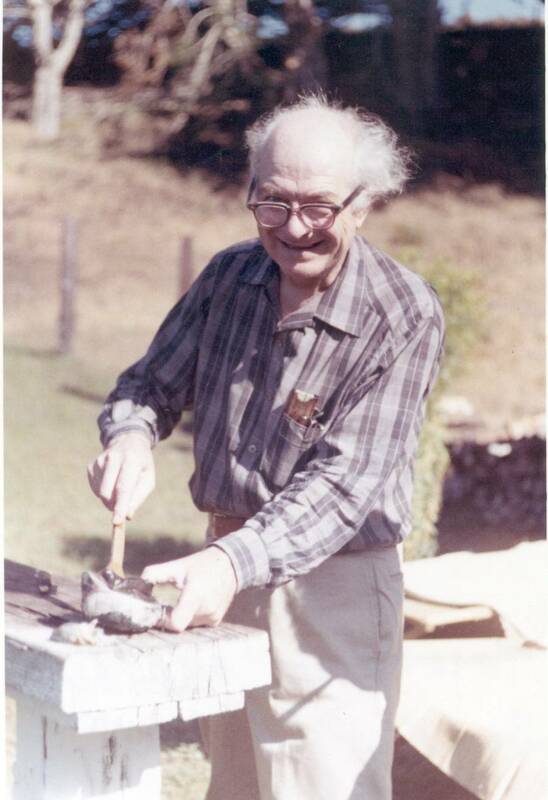 Linus Pauling on his deck at Deer Flat Ranch, Big Sur, California, 1987. 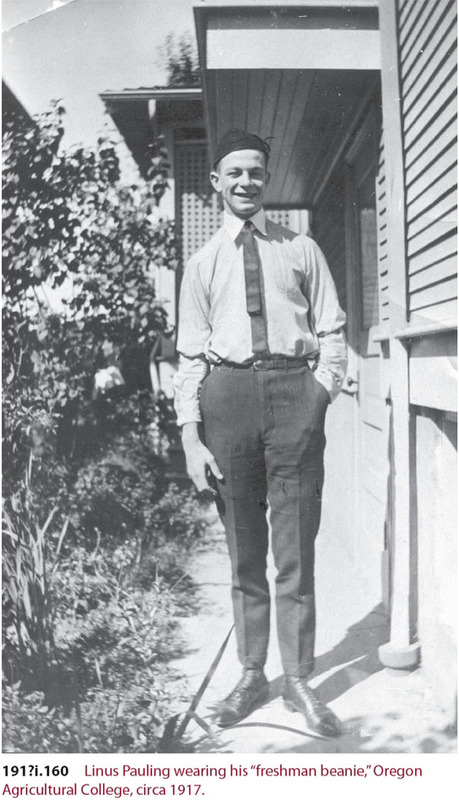 An image of young Pauling, used as an illustration in Biographical subseries 1. 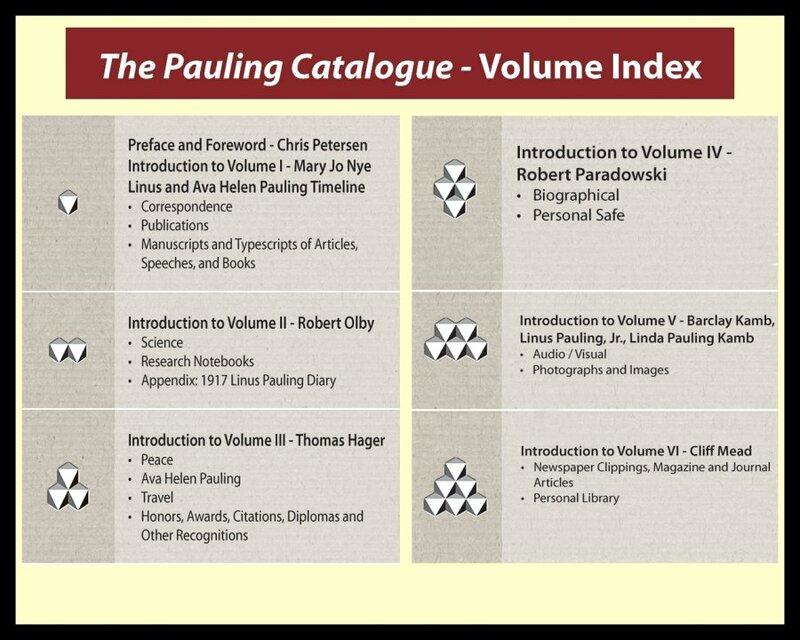 Thanks in part to a number of special features that have been incorporated into the published Pauling Catalogue, the finished product is far from a simple listing of archival holdings. For starters, each volume contains an introduction by either a major historian of science, a member of the Pauling family or a staffmember of the OSU Libraries Special Collections. 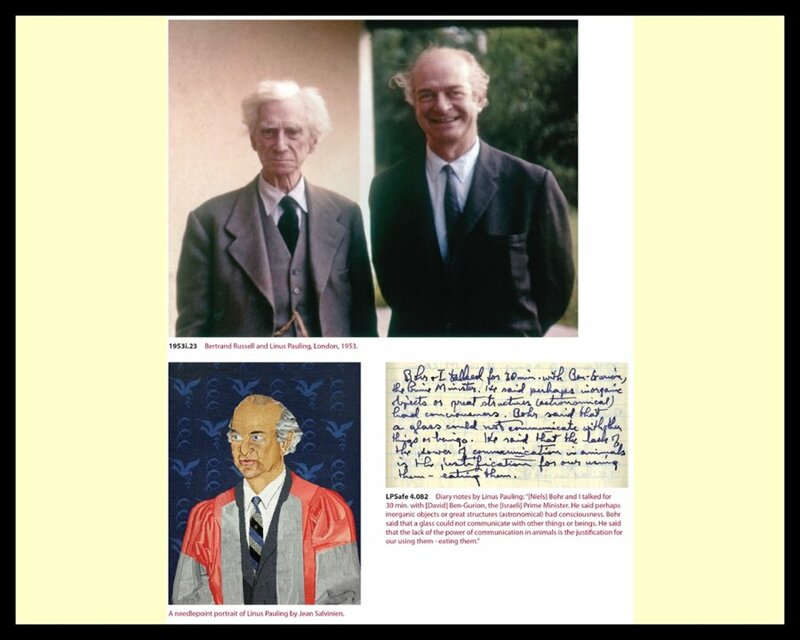 Authors include two of Pauling’s biographers, Robert Paradowski and Tom Hager, as well as Robert Olby, the pre-eminent historian of DNA and the author of a forthcoming biography of Francis Crick. 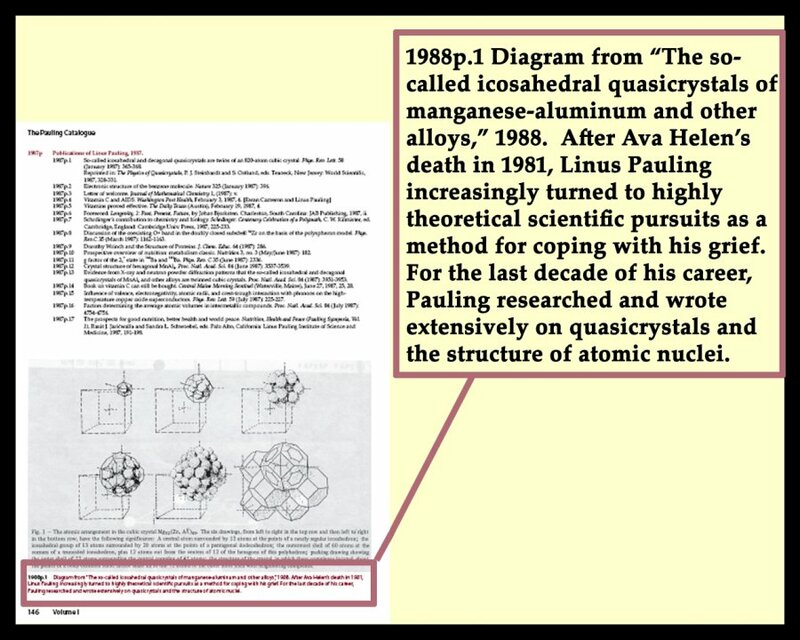 Mary Jo Nye, OSU history professor emeritus and a recent recipient of the Sarton Medal, also contributed a text, as did Linus Pauling, Jr., Linda Pauling Kamb and Barclay Kamb. Volume One contains a forty-five page Timeline, enhanced with dozens of full-color illustrations, that chronicles the remarkable lives of Linus and Ava Helen Pauling. 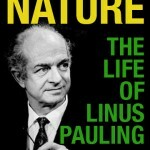 The Timeline was written by Robert Paradowski and, previous to its appearance in The Pauling Catalogue, had only been available in a very rare Japanese publication titled Linus Pauling: A Man of Intellect and Action. 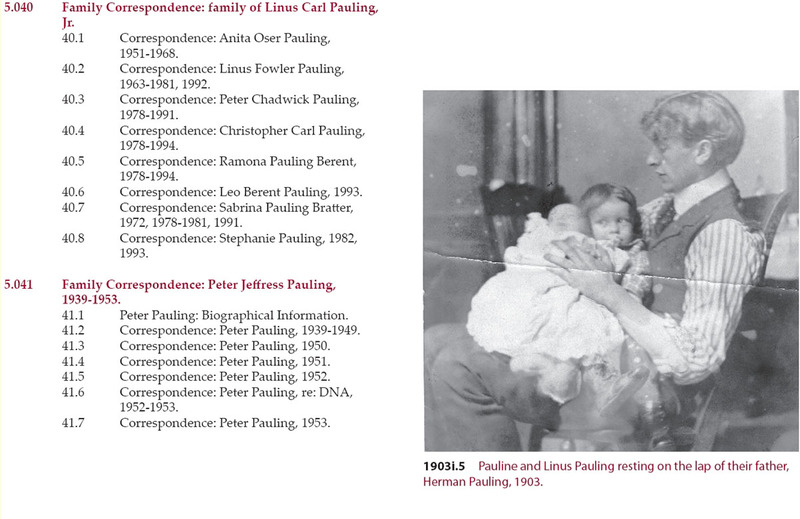 (so rare, in fact, that the only copy listed in WorldCat is the copy residing in the OSU Libraries Special Collections) Short of the various Pauling biographies that have been written over the years, the Paradowski Timeline is, perhaps, the authoritative encapsulation of the Paulings’ life and work — It’s inclusion is a terrific boon to The Pauling Catalogue. 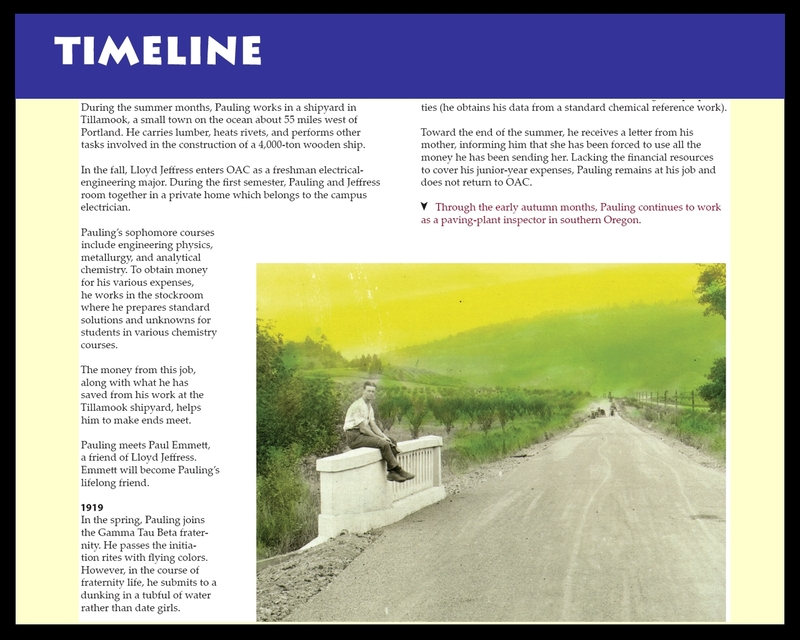 An excerpt from the Paradowski Timeline, which appears in Volume 1 of The Pauling Catalogue. Each of the six volumes contains at least eight pages of color illustrations, as well as a full index listing of all illustrations that appear in a given volume. Volume Six concludes with a Technical Note and a Colophon, which explain the processes used in creating the The Pauling Catalogue and which have served as the foundation for many of the technical blog posts developed in this series. Ultimately, it is our hope that the inclusion of these special features combine to add value to the finished project; to form a reference work that is as complete as it is authoritative. As work on The Pauling Catalogue moved further in the direction of what would become the finished product, one surprisingly difficult set of decisions requiring action concerned the typography of the set’s 1,700+ pages. After much research, two typefaces – Palatino Lynotype and Myriad Pro – and ten fonts were purchased for use in the publication. The purchase of these multiple font options was prompted by the need for a vast library of “special characters” (e.g. certain scientific symbols and non-Roman alphabetic characters) for use throughout the project. As mentioned earlier in this series, coping with the challenges presented by special characters was in part enabled by the use of XML. XSL was likewise enlisted in the battle against rogue special characters. 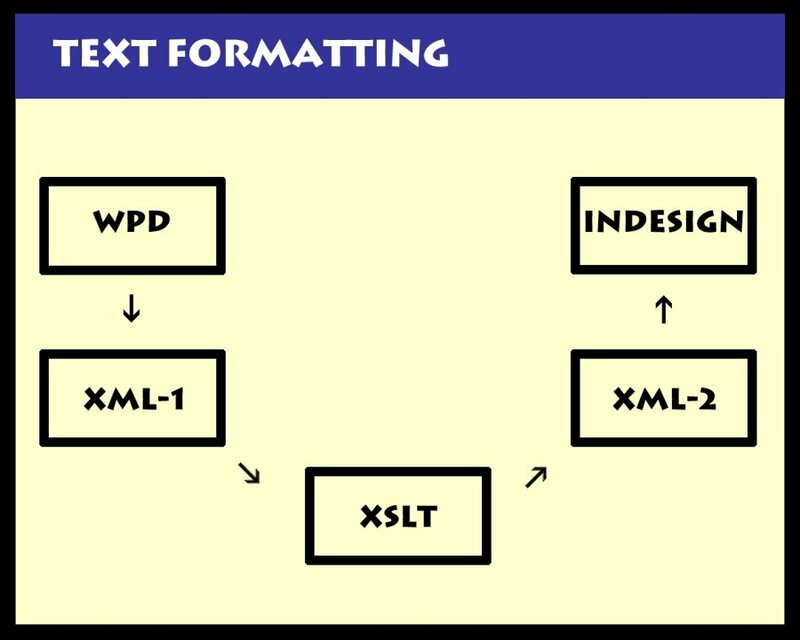 Part of what is depicted in the illustration below is the report that was generated by a custom XSL transform written to search for unsupported characters in the hundreds of thousands of lines of XML code that comprise the The Pauling Catalogue dataset. Characters for which no supportive font library could be found were displayed by the report as the symbols which have been highlighted in pink. This XSL-based approach worked effectively in identifying problematic areas of text within draft versions of the six-volume set. An example of the XSL reports used to locate missing special characters. It is worth noting too that, even with two typfaces and ten fonts working on his behalf, the project team’s graphic designer was still, in a few instances, forced to create certain symbol glyphs by hand. Two such examples are spotlighted above — the Georgian letter “vin” and the scientific “double-arrow” symbol representing a system in equilibrium. A great deal of proofreading was already built into the catalogue files as a result of nearly two decades worth of editing and spellchecking in WordPerfect. Six local drafts of The Pauling Catalogue prototype were printed out on the OSU campus over the eighteen months that the editorial staff spent developing and refining the project. Each of these drafts was line-edited by the indispensable Special Collections student staff, with special attention paid to anomalies caused by special characters. 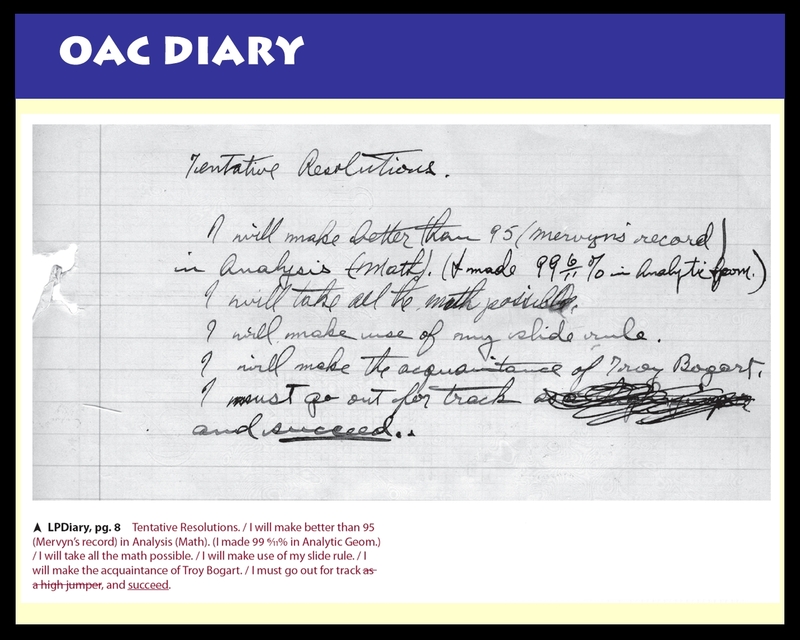 An example of the reams of notes that the students compiled is included here. Our students did an outstanding job of proofing the six local-version drafts. Image captions, page headers and prefatory materials were closely reviewed by the editorial staff. That said, a few big mistakes nearly made their way into the finished project. Can you spot the error below? We didn’t until our review of the project bluelines – the last possible point at which changes could realistically be made! 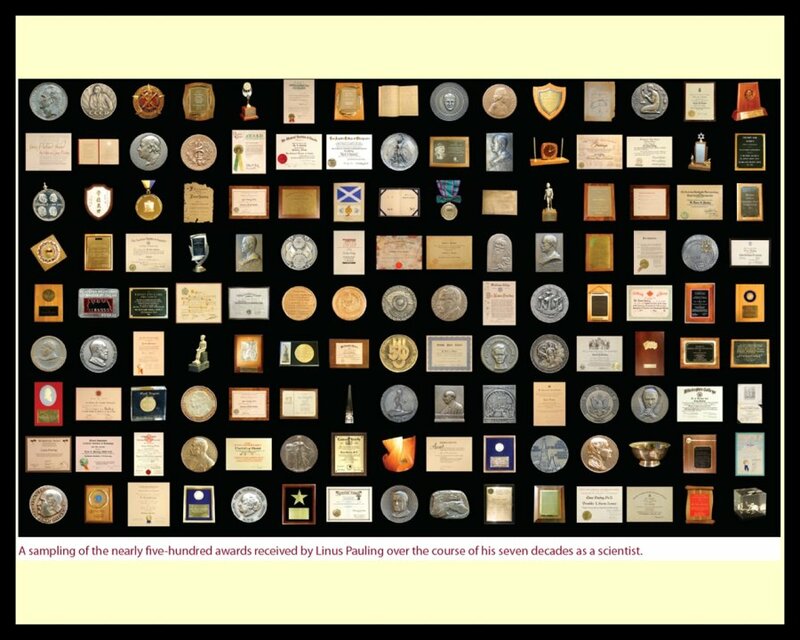 In 1931 Linus Pauling was the first recipient of the American Chemical Society's A.C. Langmuir Award, an annual recognition of the best young chemists in the U.S. This cartoon was published in the Double Bond, Jr., a satirical newspaper produced in conjunction with the A.C.S. meeting that year. 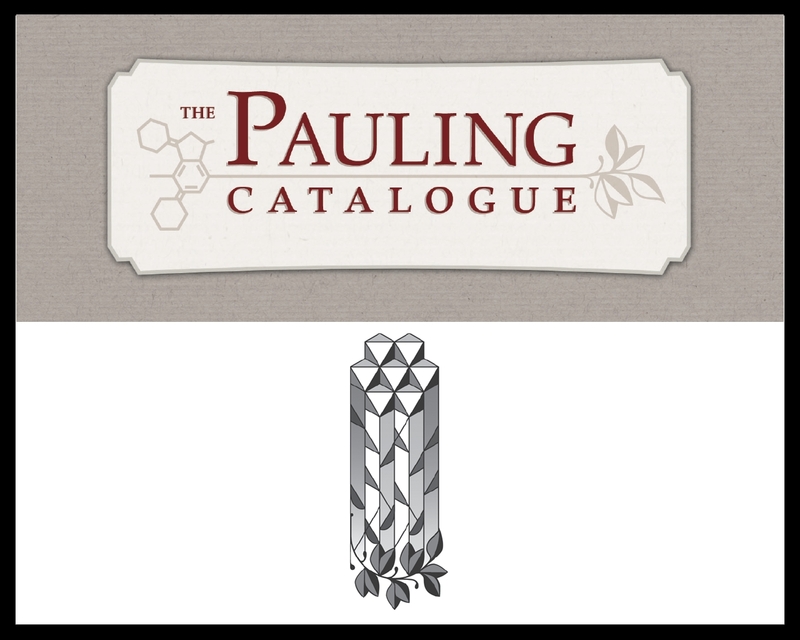 [Part 5 of 9] The Pauling Catalogue contains over 1,200 illustrations in its 1,700+ pages of text. The long process underlying the selection of these images was based upon two fundamental guiding principles. 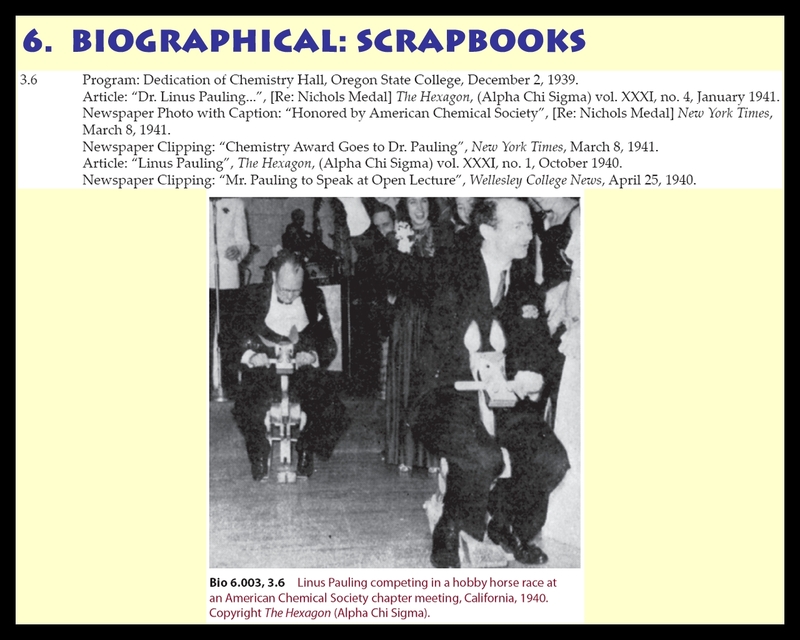 First, it was the goal of the editorial team that The Pauling Catalogue be used to display certain of the more important documents and artifacts held within the Pauling Papers. 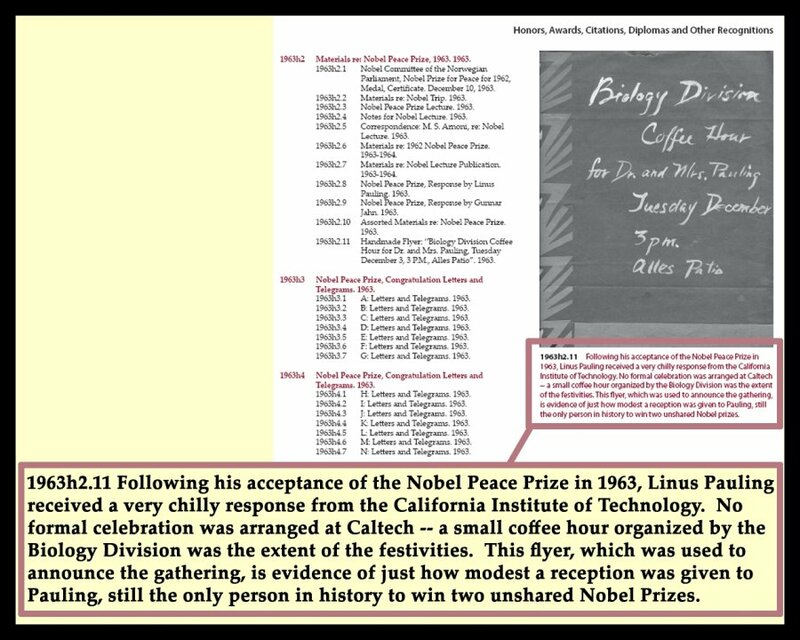 Accordingly, annotated reproductions of such noteworthy items as Rosalind Franklin’s famous “Photo 51,” Watson and Crick’s original DNA structure typescript, and Pauling’s legendary “peace placard” are all included. Of near equal importance was the desire to use image descriptions to tell some of the fascinating but less well-known stories imbued within the Pauling biography. Part of the archivist’s mission is to provide context for the documents held within their collections. The editorial team sought to achieve this end by composing extensive captions for a number of illustrations that, on the surface, would not seem to be altogether very interesting. 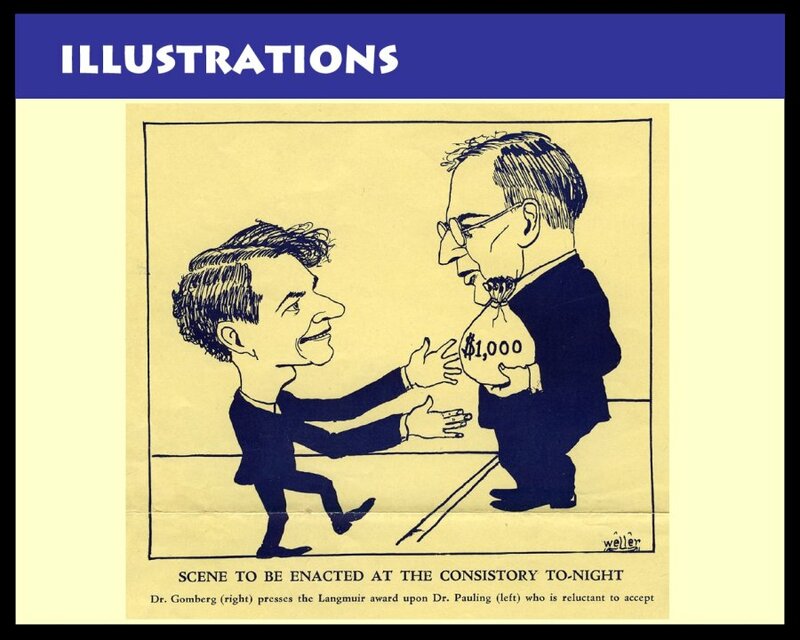 The source images for this illustration are freely available on the web at the Linus Pauling: Awards, Honors and Medals website. The composite image was created using an Excel spreadsheet and a custom PerlScript, which randomized the images. 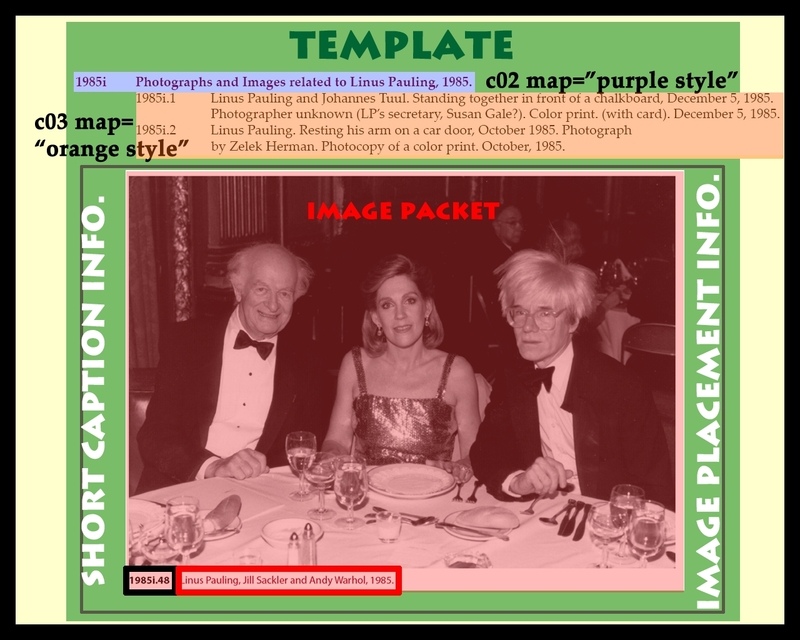 Once randomized, the images were then imported into an InDesign grid with this final composite graphic as the output. Image courtesy of Eric Arnold. An example of the remarkable diversity of content- and format-types in the Pauling collection. Illustrations were selected, scanned and organized using Excel spreadsheets. Each spreadsheet contained information on a selected item’s catalogue identification number, its location as an illustration within the published catalogue and the caption text written for the image. 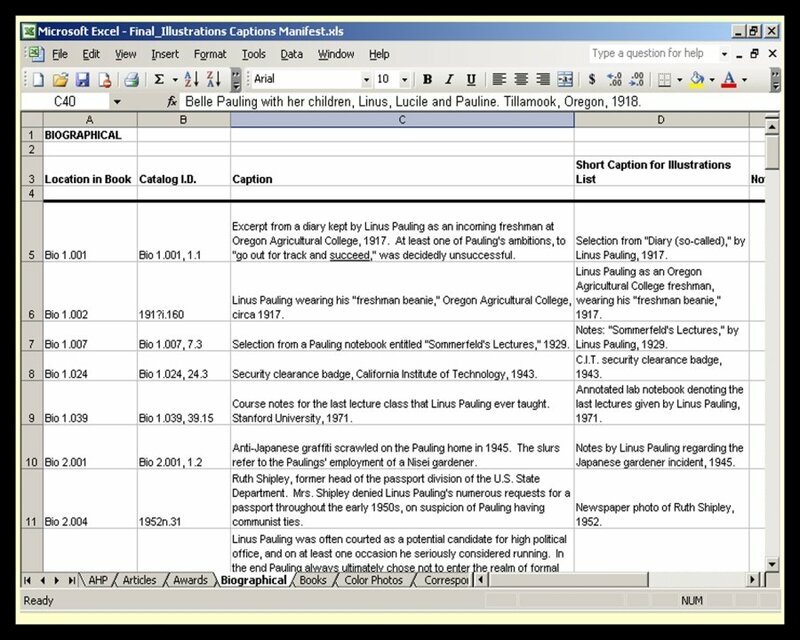 An example of the Excel spreadsheets used to establish intellectual control over the 1,200+ illustrations used in The Pauling Catalogue. Documents were scanned with a goal of achieving a minimum print resolution of 300 dots per inch, meaning that certain very small artifacts (slides, for example) required very high scan resolutions – upwards of 2400 dots per inch. As a result, the final tally of 1,200+ image scans required a sizeable amount of storage space – more than 36 gigabytes in total. Close to 350 hours were logged discerning and negotiating copyright permissions for items not controlled by the OSU Libraries. This process was made all the more difficult by the fact that many of the items in the Pauling photo collection are classified as “orphan works,” e.g. images for which little or nothing is known concerning copyright provenance. The project team’s rule of thumb was to conduct due diligence in pursuing contact information for any illustration, no matter how old. In other instances, archival context was added to image scans to enhance a given illustration’s fair-use characteristics. [Part 4 of 9] One of the earliest and most pressing questions that the project team had to answer in constructing The Pauling Catalogue was how to go about formatting the text of such a massive document. The catalogue had been generated over many years as a series of WordPerfect word processing documents. While the word processing interface worked nicely in developing working documents, moving the catalogue data out of WordPerfect and into a flexible format more suitable to a professional printing operation was a significant challenge. Ultimately it was decided to format the text data using Extensible Markup Language (XML) and Extensible Stylesheet Language Transformations (XSLT). XML is an encoding schema that adds machine-readable value to existing data. Using a series of tags applied hierarchically throughout a given data set, XML greatly enhances one’s ability to manipulate data in useful, uniform ways. This manipulation of XML-encoded data is implemented using XSLT. In a nutshell, XSL transformations consist of sets of rules that locate specific pieces of data and then either order the data pieces in a certain prescribed way or hide the data pieces entirely. 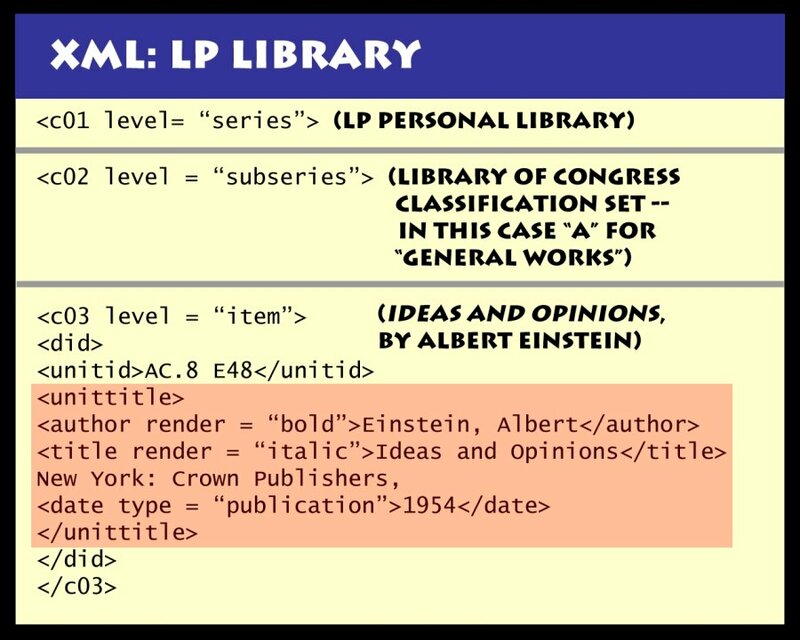 When the personal library was originally encoded for display on the web, all of the volumes that make up the series were arranged according to Library of Congress classification number. 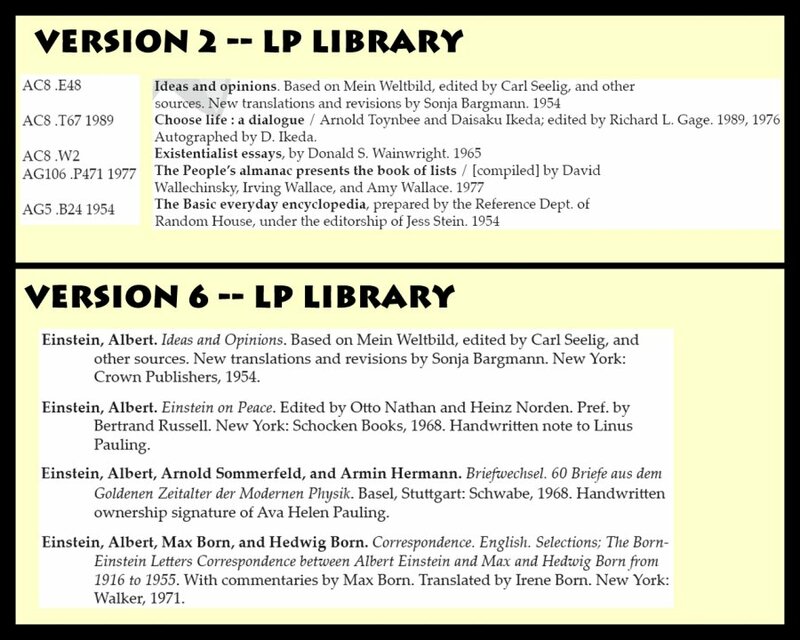 As the details of The Pauling Catalogue publication were being determined, a decision was made that the books in the Personal Library would be more useful to users of a paper reference if each item were presented alphabetically by authors’ last name. 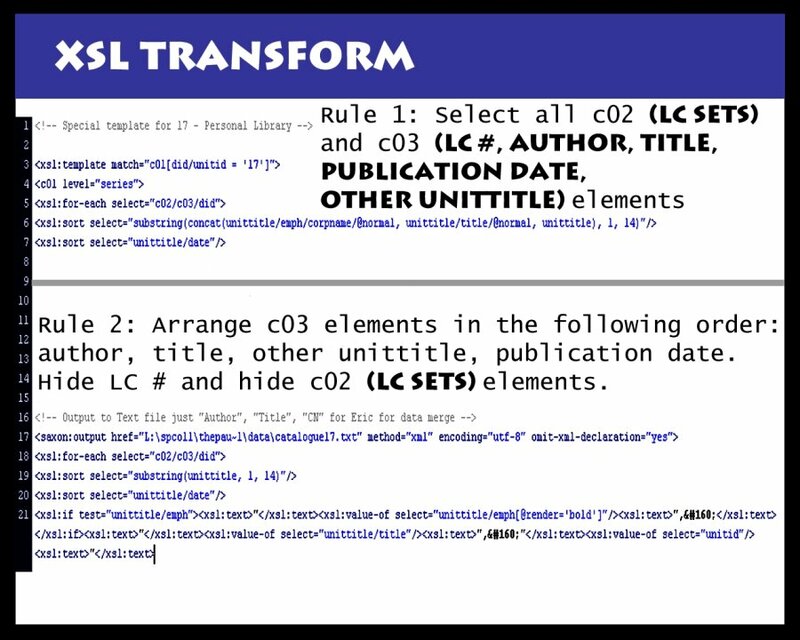 A series of rules written in XSL was used to re-sort the Pauling Personal Library arrangement. Another major benefit of XML is the standard’s support for special characters. When developing content in HTML, web authors have traditionally been required to describe special characters (e.g. scientific symbols or non-Roman alphabetic characters) using character entities. 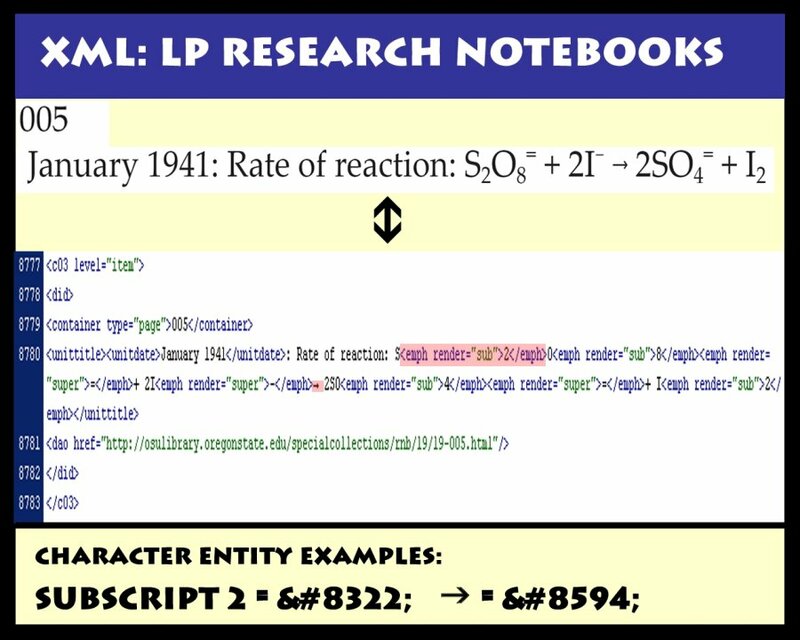 An example of the special characters mark-up used in the Pauling Research Notebooks series. XML's support of special characters encoding is significantly more intuitive and elegant than are the character entity requirements specified by HTML. While XML and XSLT provided a strong platform for the formatting of The Pauling Catalogue text, the 1,200+ illustrations inserted throughout the six-volume publication presented a new and varied set of challenges. The processes required to cope with these issues will be the subject of our next post in this series. The Pauling Catalogue is a mammoth publication — six volumes, more than 1,700 pages and over 1,200 illustrations, the entirety of which is held in a slipcase and weighs in at over twenty pounds per set. 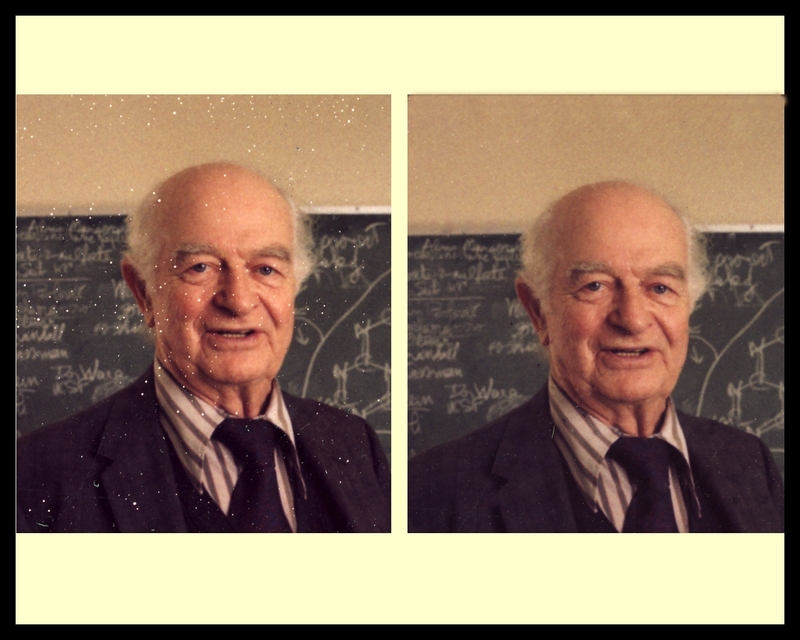 The six volumes are effectively a detailed outline of the Ava Helen and Linus Pauling Papers, a 4,400 linear foot collection that has been arranged and described using a schema of seventeen disparate intellectual series. These seventeen series — the “meat” of The Pauling Catalogue — are detailed below the jump.